For the baseball player, see JaCoby Jones. Jacoby Rashi'd Jones (born July 11, 1984) is an American football wide receiver and return specialist who is currently a free agent. He played college football at Lane College, and was drafted by the Houston Texans in the third round of the 2007 NFL Draft. Jones has also played for the Baltimore Ravens. He was selected for the Pro Bowl in 2012. Jones is known for two of the most memorable plays in the 2012 NFL playoffs: catching a 70-yard game-tying touchdown pass in the final seconds of regulation in the AFC Divisional playoff game against the Denver Broncos, which helped lead the Ravens to an eventually 38–35 double overtime victory; and a 108-yard kickoff return for a touchdown in Super Bowl XLVII, the longest play in Super Bowl history. Jones lived in New Orleans East. Jones attended St. Augustine High School and Marion Abramson High School in New Orleans, Louisiana. As a second-year student (junior) at St. Augustine he learned that the school considered him too small to play on the football team. Allen Woods, his godfather and the assistant principal of Abramson, advised him to transfer to that school. At Abramson, he was a letterman in football, basketball, and track. In basketball, he was an All-Metropolitan selection and an All-Area selection. In track, he was an All-Metropolitan selection and an All-Area selection, with a personal best of 10.28 seconds in the 100 meters and 21.3 seconds in the 200 meters. His childhood house and high school were destroyed by Hurricane Katrina. Jones originally enrolled on a track scholarship at Southeastern Louisiana University in 2002, but transferred to the Division II school Lane College in 2003. At Lane College, Jones became a three-time All-Southern Intercollegiate Athletic Conference (SIAC) player his sophomore, junior and senior seasons as well as an excellent punt/kick returner. Jacoby is a member of Omega Psi Phi Fraternity. Jones was drafted by the Houston Texans in the 3rd round (73rd overall) of the 2007 NFL Draft. His first touchdown reception was against the Tennessee Titans in week 2 of the 2009 season. He also returned a punt for a 70-yard score against Miami in week 6 of the 2008 season. Jones continued to be relatively valuable as both a receiver and a returner, though he sometimes struggled with drops. 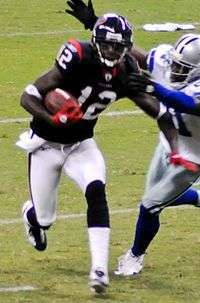 On January 15, 2012, in the 2011 AFC Divisional Playoff game against the Baltimore Ravens, Jones muffed a punt that contributed to the Texans defeat. He was rushed by Cary Williams and the ball was recovered inside the Texans 5-yard line by Jimmy Smith. On May 1, 2012, Jones was released by the Texans. On May 8, 2012, Jones signed a two-year, $7 million deal with the Baltimore Ravens. On October 14, 2012, Jones returned a kickoff for 108 yards and a touchdown in a win against the Dallas Cowboys, tying an NFL record for longest kick return. On November 11, 2012, Jones returned a kick-off for 105 yards in the Ravens' 55–20 win over Oakland Raiders, becoming the first player to return two kicks for 105 yards or more in a season. On November 18, 2012, in a division game against the rival Pittsburgh Steelers, Jones returned a punt 63 yards for a touchdown, helping the Ravens win the game 13–10. It was the first time the Ravens returned a punt for a touchdown against the Steelers. Jones was named to his first Pro Bowl as a kick returner for the AFC roster and was selected for the 2012 All-Pro team. His stellar play would continue in the playoffs. On January 12, 2013, in the AFC Divisional Playoff game against the Denver Broncos, the Ravens were down 35–28 and had one last chance to tie the game. On 3rd down and 3 from the Ravens own 30-yard line, Jones caught a 70-yard touchdown pass from Joe Flacco with 31 seconds left. The play, dubbed the "Rocky Mountain Rainbow" and the "Mile High Miracle", tied the game at 35 and preceded a 38-35 double overtime win for the Ravens. In Super Bowl XLVII against the San Francisco 49ers, Jones became the first player to score a receiving touchdown and return touchdown in a Super Bowl. With under two minutes to play in the second quarter, Jones hauled in a 56-yard pass from Joe Flacco, eluding two defenders to score a touchdown. Jones then returned the opening kickoff of the second half for a 109-yard touchdown for the longest play in Super Bowl or postseason history. The Ravens won the game 34–31, earning Jones his first Super Bowl ring. Jones was then the feature player on the cover of the Super Bowl XLVII edition of Sports Illustrated. During the 2013 regular season, Jones was injured in the Kickoff game in Week 1 when teammate Brynden Trawick ran into him during a punt return. Jones would not return until Week 6 against the Green Bay Packers, where he had his first receiving touchdown of the season. In Week 13, on Thanksgiving against the Pittsburgh Steelers, Jones returned a kickoff that would seemingly go for a touchdown, however Steelers head coach Mike Tomlin disrupted his route by "unknowingly" standing on the field while looking at the big screen in M&T Bank Stadium. The Ravens would later win by a score of 22-20. The next week, in a snowy game against the Minnesota Vikings, Jones returned a kickoff 77 yards for a touchdown in the final two minutes. The Vikings would then answer with another touchdown with 45 seconds remaining, until teammate, Marlon Brown, scored the game-winning touchdown with 4 seconds remaining, allowing the Ravens to win the game 29-26. In week 15, the Ravens played the Detroit Lions on Monday Night Football. On a crucial 3rd & 15 with two minutes left in regulation, Jones caught a pass from quarterback Joe Flacco that was good for the first down. Shortly after that, second year kicker Justin Tucker kicked a career high and team record field goal from 61 yards for the 18-16 win. Jones had 6 receptions for 80 yards that game. After testing the free agent market, on March 12, 2014 Jones decided to remain with the Baltimore Ravens and agreed to a four-year, $12 million contract with $4.5 million guaranteed. Jones saw diminished productivity for the 2014 season and was released from the Baltimore Ravens on February 25, 2015. He was due 2.5 million for 2015 season. On March 6, 2015, Jones signed with the San Diego Chargers. The contract was for 2-years, $5.5 million with $1.6 million guaranteed and a $1.6 million signing bonus. He was released on November 3 after the Week 8 match-up against the Ravens. Jones was claimed off waivers by the Pittsburgh Steelers on November 5, 2015. Jones wore number 13, since his normal number 12 was unofficially retired for Terry Bradshaw. After fumbling twice against the Indianapolis Colts, Jones was demoted to backup kick returner and third-string punt returner on the depth chart. He was released on January 1, 2016. In four games with the Steelers, Jones had 6 punt returns for 19 yards and 9 kick returns for 220 yards. On February 24, 2013, Jones was the first star announced to be on Season 16 of Dancing With the Stars. He partnered with season 13 winner Karina Smirnoff. They reached the finals but came in third place. 3 Prom Group Dance/"The Rockafeller Skank"
6 Quickstep/"For Once in My Life"
8 Viennese Waltz / "It's a Man's, Man's, Man's World"
Semi-finals Argentine Tango / "Concierto Para Quinteto"
Finals Jive / "Shake It"
Freestyle / "Can't Hold Us"
In the early morning hours of September 23, 2013 Jones was struck over the head by a champagne bottle; allegedly swung by a stripper while on a party bus with Bryant McKinnie and friends. Over the 2014 Memorial Day weekend, three Baltimore Ravens players including Jacoby Jones were tossed out of an Ocean City, Maryland nightclub. Reports state Jones, Bernard Pierce and Jimmy Smith were all asked to leave for an inability to “maintain their composure”. On September 23, 2009 Jones pleaded guilty in a Texas court for a March 2008 DUI arrest in Houston, TX. ↑ Rosenthal, Gregg. "Jacoby Jones' 108-yard return TD a Super Bowl record". NFL.com. Around the NFL. Retrieved 10 September 2016. 1 2 Borden, Sam (February 4, 2013). "For the Ravens’ Jones, a Trip Home and 2 Trips Into the End Zone." The New York Times. Retrieved on March 17, 2013. "Jones grew up in New Orleans East and attended Abramson High School, but his family’s house and his high school were destroyed in Hurricane Katrina." ↑ Terrell, Katherine (January 15, 2013). "Abramson graduate Jacoby Jones made the most of his chance in stunning Ravens' victory." The Times-Picayune. Retrieved on March 17, 2013. ↑ Sessler, Marc (January 16, 2012) Texans' Jones apologizes, moves forward after muffed punt. NFL.com. Retrieved on May 1, 2013. 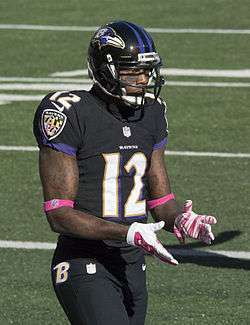 ↑ Nielsen, James (May 1, 2012) Ultimate Texans » Texans release much-maligned receiver Jacoby Jones. Houston Chronicle via Blog.chron.com. Retrieved on May 1, 2013. 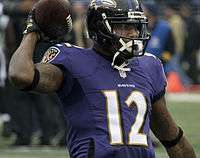 ↑ Smith, Michael David (May 8, 2012) Ravens sign Jacoby Jones to two-year, $7 million deal | ProFootballTalk. Profootballtalk.nbcsports.com. Retrieved on May 1, 2013. ↑ Vensel, Matt (October 17, 2012) Baltimore Ravens wide receiver and kick return Jacoby Jones, the AFC Special Teams Player of the Week, is ready to play his former team, the Houston Texans – Baltimore Sun. Articles.baltimoresun.com. Retrieved on May 1, 2013. ↑ NFL Network: Jacoby Does It Again: 63 Yd TD Return. Baltimoreravens.com (November 18, 2012). Retrieved on May 1, 2013. ↑ Hensley, Jamison (March 12, 2014). "Jacoby Jones re-signs with Ravens". ESPN.com. Retrieved 2014-10-22. ↑ "Ravens cut Jacoby Jones". ESPN. Retrieved 25 February 2015. ↑ "Jacoby Jones joins Chargers". ESPN. March 6, 2015. ↑ "Chargers Add Explosive Playmaker Jacoby Jones". NFL.com. March 6, 2015. ↑ Florio, Mike (November 3, 2015). "Chargers dump receiver Jacoby Jones". NBCSports.com. Retrieved November 8, 2015. ↑ Sessler, Marc (November 5, 2015). "Steelers release draft-bust Archer, add Jacoby Jones". NFL.com. Retrieved November 8, 2015. ↑ "Jacoby Jones now Steelers' third-string punt returner". NFL.com. Retrieved 2015-12-08. ↑ "Jacoby Jones released by Pittsburgh Steelers". NFL.com. Retrieved 2016-01-02. 1 2 "Jacoby Jones Stats". ESPN Internet Ventures. Retrieved 5 February 2014. 1 2 3 4 5 6 7 "Houston Texans Kick & Punt Returns Career Register". pro-football-reference.com. 1 2 3 "Baltimore Ravens Kick & Punt Returns Career Register". pro-football-reference.com. Wikimedia Commons has media related to Jacoby Jones.